Not everyone understands the Method. In fact, even a lot of highly trained actors are confused by what it is. And what it is not. At essence, the art of acting is the search for the soul. It’s about finding and revealing what makes you both unique and universally human. This is what’s meant by “find the truth in your character.” You’re not making up backstories – we call those “alternative facts” in today’s parlance – you’re revealing what is authentic and real inside you. When you have an authentic emotional experience on stage, or in front of the camera, other actors feel it. The audience/viewer feels it. Disbelief is suspended and you all enter the realm of performance as art together. As an actor, it’s your responsibility to find truth in imaginary circumstances. It’s essential that you first identify feelings inside yourself that are analogous to your character’s feelings. This is what we all learned in acting classes. And sometimes we get lucky. So wonderfully lucky. There’s a transcendent spark in your performance. Everyone feels it. It’s magic. But then things get tricky because you can’t repeat it. You go from the thrill of heaven to the despair of hell. The burning question becomes how can you consistently achieve that emotional reality, on demand, night after night, shot after shot? 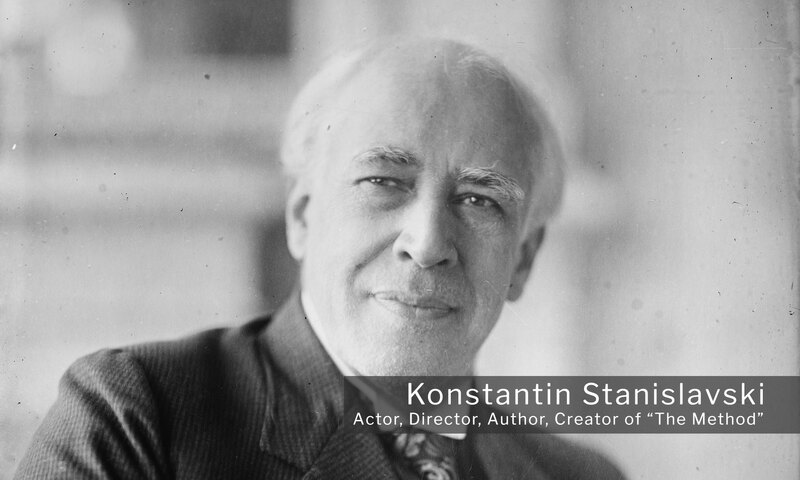 Constantin Stanislavski defined a Method for acting that allows you to directly access your feelings. “Directly” means that you don’t demand that your psyche produce these feelings. Rather, you already have these feelings. They’re intrinsically part of you. And the Method enables you to access them, consistently. No hit-or-miss. No maybe tonight, maybe not. Each performance will be fresh and original exactly because it is emotionally real. Acting ceases to be a confining rote craft and becomes instead a fresh new moment, every performance. Stanislavski proved that highly personal, and very real, feelings could be lured from the unconscious of the actor through a specific technique. Today, we have many and varied styles of acting: representational, presentational, mechanical, exploitative, etc. Stanislavski’s principles provide serious actors of all stripes with a learnable Method of accessing personal emotional material and converting that to character performance. By any name, it’s the very heart of an authentic, dynamic performance. On demand, night after night, shot after shot.